The Congressional Budget Office predicted in June that enrollment through the exchanges would reach 20 million in 2016 and then level off around 22 million through 2025. The White House accepted the budget office’s estimate for 2014 as a goal, but now administration officials do their own analysis and projections, and they take issue with the office’s numbers. Those numbers caught my eye, as they're 1 million and 2 million fewer respectively than the CBO's March report...and I didn't recall seeing any more recent update. 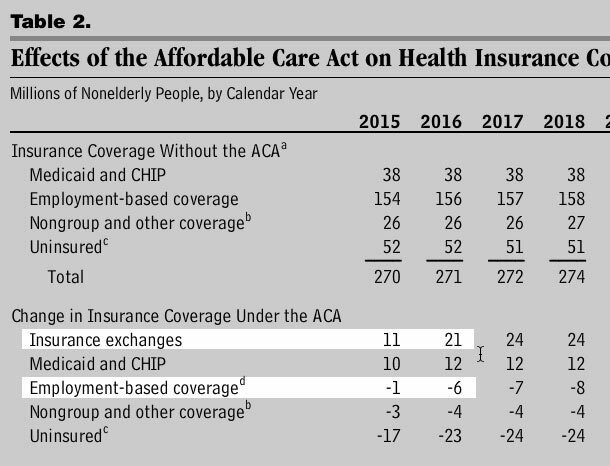 Obviously the numbers are negative because you're talking about the impact of repealing the law, but the point is the same: Between March and June, the CBO knocked both their 2016 and 2017 QHP enrollment projections down by 1 million each (from 21 million to 20 million in 2016, and from 24 million to 23 million for 2017). Interestingly, they also see the long-term enrollment numbers going down slightly starting in 2023 (to 22 million) for reasons unknown (this, however is nothing new; they've had the 10-year numbers bobbling up and down by a million or so going all the way back to 2013). Anyway, this doesn't really change my own projection; I'm still calling for 14.7 million QHP selections during 2016 Open Enrollment. I just thought it was worth noting given that both the HHS Dept. and myself are projecting such a smaller number than the CBO either way.